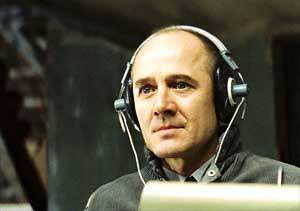 At the Academy Awards this year,The Lives of Others was judged Best Foreign Language Film. The fact this reviewer had hoped the German film would lose to Guillermo Del Toro’s poignant horror-fantasy/historical epic Pan’s Labyrinth says more about personal taste than it does about cinematic quality. While it may not have the most striking title (having lost something in translation from the original German, Das Leben der Anderen), as a film The Lives of Others is difficult to fault. It takes the viewer deep into the heart, both metaphorically and geographically, of the socialist German Democratic Republic. At the film’s core is the relationship between playwright Georg Dreyman (Koch) and actress Christa-Maria Sieland (Gedeck). Due to the GDR’s Orwellian approach to censorship and control, both of their respective careers are under constant, thinly veiled threat; which adds additional tension to their already strained relationship. Dreyman has been allowed the tentative belief that he’s one of the country’s few 'trusted' high-profile playwrights. However, unknown to either him or Sieland, their apartment has been bugged, and is under 24-hour surveillance—which should equal a whole lot of trouble, considering where their political sympathies secretly lie. Fortunately for them, the Stasi officer assigned to their case, Captain Gerd Weisler (Mühe), through whose eyes most of the film unfolds, is not as cold as he first appears. Gradually Weisler vicarious involvement in the couple’s lives turns to affection—but this may end up having dire consequences for all involved. Essentially a low-key political thriller, the film is virtually impeccable on all fronts, featuring slow but steady pacing, a light-touch approach to exposition, finely crafted dialogue and excellent performances from each member of its cast. In this last category, it’s Mühe who really shines. The introspective Weisler has little dialogue or even action, leaving Mühe to communicate the character’s redemptive character arc using, for the most part, only the most subtle of facial expressions. He does this so effectively that, even during his earliest scenes, when we see him lecturing on the Stasi’s calculated interrogation techniques, we can sense the barest glimpse of the warmth that will later bloom during his intimate, voyeuristic experience of Dreyman and Sieland’s human dramas. The Lives of Others is part of the recent wave of acclaimed German films (Good Bye Lenin!, Downfall, Sophie Scholl et al.) that turn an unflinching cinematic eye on the country’s troubled 20th century, while simultaneously seeking out stories of hope, inspiration or simple humanity. In this case, the film succeeds in finding all three qualities, making this one unforgettable journey through dark recent history. Loved the film, brilliant review. I loved the film. "the lives of others" and thus was happy to find agreement; however, the review impressed me because it gave greater insights into the film's qualities. Also it gave other films I should enjoy. A new ocker comedy depicts young protégés at a suburban dance school immersing themselves in choreographies about starvation, people dying of AIDS and the nuclear holocaust. John Carroll's The Existential Jesus affirms a view expressed by Nick Cave that the bloodless, placid Jesus offered by the Church denies Christ his potent, creative sorrow, and the boiling anger that confronts us so forcibly in the Gospel of St Mark.